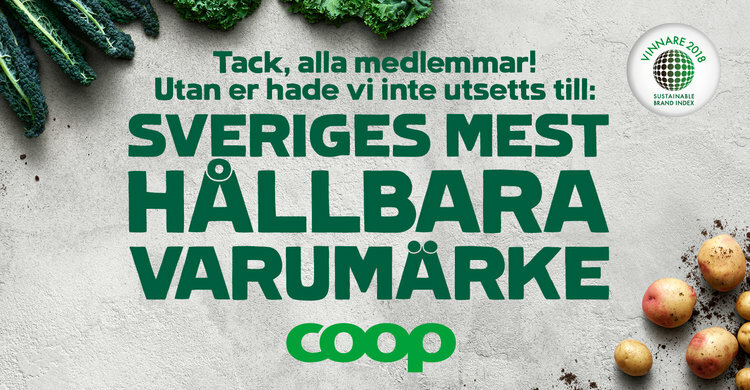 This April 2018, Coop has been announced as the winner of Sustainable Brand Index in Sweden. With that, the supermarket co-operation can call itself the most sustainable brand according to Swedish consumers in 2018. Coop has taken over the first place from Apoteket, who has been leading the index for the past two years (see the entire ranking and report here). Coop’s leading position this year is first of all due to its dedication to environmental and climate issues. When it comes to diversity in the workplace and fair working conditions, Coop also scores relatively high compared to other brands in Sweden. As a co-operation founded in 1875, Coop has always had a strong sense of responsibility to its customers and members and states to have sustainability in its DNA. One of the reasons Coop's climate focus is a success factor, is because Swedish consumers think it is one of the most important sustainability issues today. From all Sustainable Development Goals, 37% of Swedes think that number 13: Climate Action is the most important for companies to prioritise today. We spoke to Coop’s CEO, Magnus Johansson, about Coop’s sustainability efforts and position in Sustainable Brand Index this year. Congratulations! How Important Has Winning Sustainable Brand Index Been For Coop? At Coop we are extremely proud to win this year’s Sustainable Brand Index in Sweden and being able to call ourselves the most sustainable brand according to Swedish consumers. It is really great! We have all worked hard to make Coop one of Sweden’s most green and most responsible companies. The Sustainable Brand Index results show that we are on the right track. We are so grateful for all our customers and members who have made this possible. As Coop's CEO, How Do You Work With Sustainability Within The Company? Sustainability is part of our DNA. We are a member organisation with 3.5 million members and 650 stores throughout Sweden, which represents our way of working. The voices and interests of our members have always been our main priority. My focus as CEO is to ensure that we deliver food inspiration in an affordable and sustainable way to our customers. This is our promise to them. The demand for sustainability among consumers is growing in general, especially when we look at issues around lifestyles. People want to know what their food contains and how it is produced. This shift in mindset and knowledge level sets the standards for products higher. The increased awareness of consumers, of the impact of food on their own health and the environment, drives the sales of organic and vegetarian foods. Nowadays, consumers demand that products are produced in a safe and environmentally friendly way. We see that a growing interest in food is accompanied by a growing interest in its source. In terms of health trends, we do see that Sweden is one of the countries where obesity is unfortunately growing and sugar and salt are over consumed. Which Sustainability Issues Will Be The Main Focus Point For Coop In The Near Future? Two years ago we put a strategy in place, that focuses on having a wide range of sustainable products in stores that are designed around sustainability, together with producers that work with sustainable practices. This means that we shall offer our customers and members affordable, healthy and sustainable products (incl. organic, third-party certified and fair trade) products. We will also work on becoming more resource-efficient to save costs and the environment long term (transport via train, electricity, energy efficiency etc)and save costs on the long-term. Lastly, What Do You Plan On Doing In Order To Keep You Leading Position In Sustainable Brand Index Next Year? Sustainability in an important promise we have made to our customers and at Coop we have been committing to it for several years. I believe we need to simplify our communication message even further, to keep being noticed in the noise of today’s world. We also need to continue the work even more on implementing sustainability in our stores, online and in the app, where we actually interact with our customers on a daily basis.Personally, I also see a lot of potential in cooperating with suppliers, start-ups, NGO’s and talented chefs like Paul Svensson and Lotta Lundgren to make Coop even better.